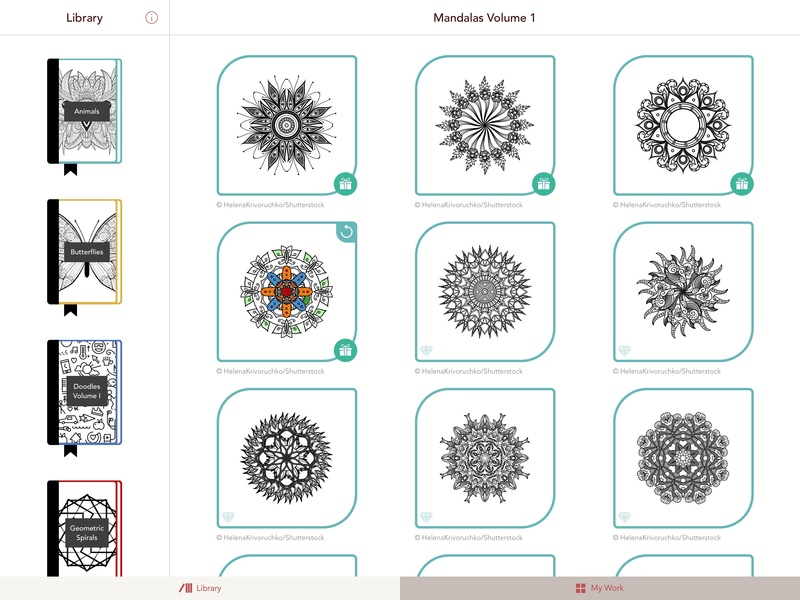 I first heard of the adult coloring book trend from my friend Myke, who described on various podcasts and Slack conversations how coloring mandala-like patterns helps him concentrate and relax while doing something else. In a peculiar case of Baader-Meinhof Phenomenon, I then started hearing about the popularity of adult coloring from a lot of people – all of them, apparently, owners of physical books with empty artistic designs which need to be filled with color. While I don't own any adult coloring books myself, I've been intrigued by the trend enough to do some research. The origin story of the modern adult book coloring trend goes somewhat like this: Scottish artist Johanna Basford convinced British publisher Laurence King to order an initial run of 'Secret Garden: An Inky Treasure Hunt and Coloring Book'. Since its release in 2013, the book has sold over two million copies worldwide. As noted by The Atlantic, adult coloring also started spreading in France when, in 2012, publisher Hachette released Art-Thérapie: 100 Coloriages Anti-Stress'. It was so successful, Hachette had to launch a full series, which has sold more than three and a half million copies so far. The New Yorker has a great primer on the rise of adult coloring books and the initial work of Johanna Basford and Hachette. In another piece for The Atlantic, Julie Beck described adult coloring as offering the "relief and mindfulness without the paralysis that a blank page can cause"; the constraints of objects designed by others with the sole purpose being coloring them helps a lot of people relieve stress and engage a part of their brain that can either take their mind off daily concerns or, like Beck noted, use multitasking to relax. Evidence – both factual and anecdotal – indicates that adult coloring has now turned into a global, lucrative phenomenon: mainstream media are talking about it, 5 out of 10 of the top books on Amazon are adult coloring books, and, if you go into a bookstore today, there's a good chance you'll find a section dedicated to books filled with patterns of flowers, natural landscapes, exotic objects, animals, and more. Back in November, I half-jokingly sent a tweet in response to John Gruber saying that the first developer to figure out how to make an adult coloring app with Apple Pencil integration would find success on the App Store. I don't know if they're going to make "millions" as I quipped, but California-based studio Pixite – specialized in photo apps for iOS and Android – is following the path I imagined. Today, Pixite is launching Pigment, an adult coloring app for iPhone and iPad that, however, is best enjoyed with the closest digital equivalent of a physical book: an iPad Pro paired with an Apple Pencil. Pigment works in a rather unsurprising way: the app launches to a library of digital coloring books, ranging from animal figures such as butterflies and birds filled with smaller patterns to flowers, geometric shapes, 3D structures, and the omnipresent mandalas for a total of 200 illustrated works. Most of the books' artworks have been licensed from Shutterstock, but there are also books by independent artists as well as patterns created with Assembly, Pixite's innovative design tool for iOS. 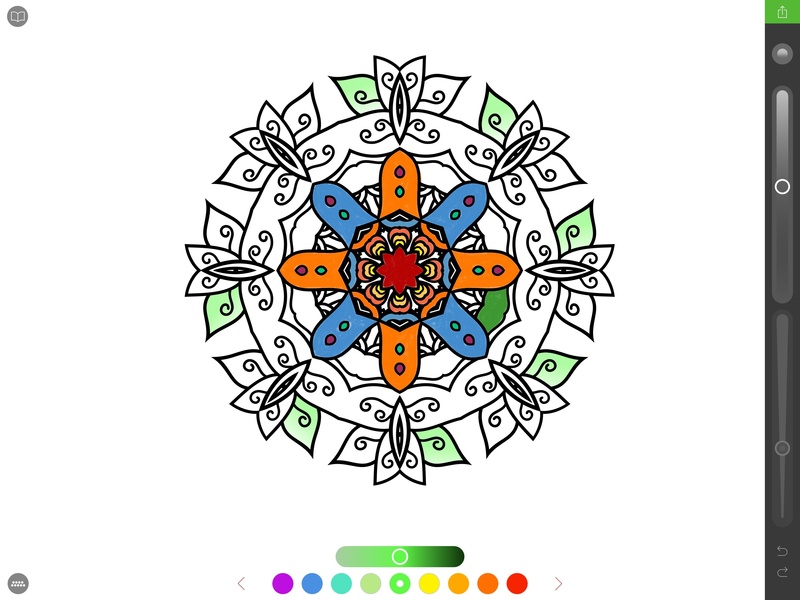 It's a good selection of themes and patterns, in line with popular trends in adult coloring books and a solid start for an app that wants to replicate the coloring experience on an iPhone and iPad. The star of the show, obviously, is the Apple Pencil. Once you've selected a design you want to color, grab the Pencil, pick a color from the palette, and start coloring. In my tests, the Pencil's fine tip and smooth performance worked remarkably well with Pigment: coloring with the Pencil felt natural and rewarding. Thanks to palm rejection, I could rest my hand on the right side of the screen and color without lines being accidentally drawn; as I noted in my initial review of the Pencil, everything feels smooth and responsive with imperceptible lag. As an app, Pigment is devoid of many of the limitations of paper. In addition to choosing from multiple color palettes (14 of 9 colors) and adjusting brush size and opacity, you can zoom and pan on the canvas, which is convenient to color smaller areas and details (shapes are scalable, too, so they don't lose any detail when zooming). You can also add linear and radial gradients by holding with the Pencil on screen after selecting specific tools. And – this is Pigment's stronger convenience over physical books – you can tap an area of the design to isolate it, draw inside it, then tap again to interact with the full canvas. This is useful to avoid having colors end up in other sections, though it somewhat dumbs down the process of coloring precisely and being careful with your hand. As a 1.0, Pigment has a few issues that could be easily remedied in future updates. Despite the good selection of palettes and colors, I wish I could create my own palettes and colors from scratch, like I can in Paper; also, the app doesn't remember the last selected color and doesn't have a color extraction tool, which makes it tricky to match existing colors if you're reopening a design after a restart. 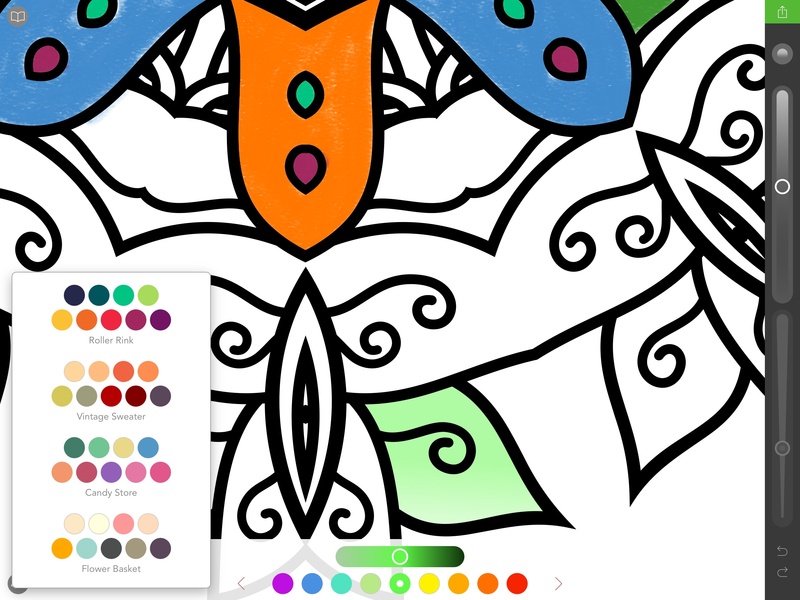 After following the adult coloring book scene from the sidelines for the past few months and trying Pigment on my iPad Pro, I think Pixite's latest creation is the perfect example of an innovative iPad app, targeted at a niche made big enough by the Internet, based on a potentially profitable business model. While free to download, in fact, Pigment requires a Premium subscription to get full access to its library of 200 illustrated works. Pigment Premium Access is free to try for a week, and then it'll cost you $4.99/month or $24.99/year to download every available design, including new ones that will be added in the future. A premium subscription also removes watermarks from shared images and allows for high-resolution export at 4096x4096 pixels. I don't think the adult coloring book trend is absurd. I understand why people like Myke and millions of others find the practice of coloring complex patterns calming and joyful – there's something about not starting from a blank page and focusing on colors that I think can be therapeutic and lower stress. As a digital version, Pigment largely accomplishes the goal of replicating the act of book coloring without the overhead of paper and physical tools. Coloring with the Pencil is a pleasure: combined with the drawing tools in the app and iOS' smooth performance, using the Pencil in Pigment results in a credible approximation of real books. I couldn't see myself as someone who'd try the book coloring hobby after all, but I enjoyed Pigment and I found it relaxing and well-executed. Pigment is a clever use of the iPad Pro and Apple Pencil, and it's a free download from the App Store.